The financial services industry has always been on the front lines of a raging battle to understand, manage and process paper documents. Mortgages, policies, applications, loans and statements create a torrent of paper that can challenge any organization. Overwhelmed by paper documents, and the problems of processing them, public cases of banks losing documents, sending incorrect documents, or mishandling loan data are on the rise. 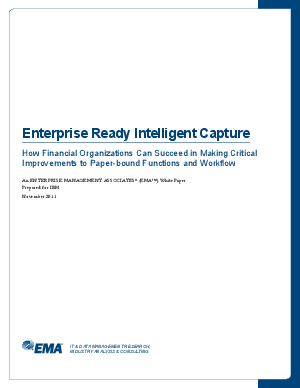 This Enterprise Management Associates® (EMA™) paper explores “Enterprise Ready Intelligent Capture” as a way for organizations to make critical improvements to long-standing paper-bound functions and workflow. Read on to learn more.